An integral part of Greenville, South Carolina's downtown revitalization project has been completed. The Brio, a diamond in the rough, was once a Ramada Inn but has been renovated into luxury condominiums. A penthouse on the sixth floor, a 1,400-square-foot residence, is on the market. "If you like to be away from it all but close enough to the action, then this is the place," says owner Dave Cowden. Located a half mile from Falls Park and downtown, The Brio offers private parking with gated access, a swimming pool and a pet walking trail. 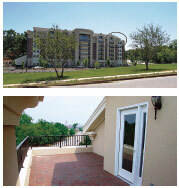 The penthouse is a corner unit with a private 300-square-foot terrace with an unobstructed view of downtown Greenville. The home features lofted ceilings, a large master suite with whirlpool tub and separate shower, stainless steel appliances, granite counter tops, hardwood cabinets, ceramic tile in the kitchen and baths and hardwood floors throughout the downstairs.